Did you know that 90% of all diabetes, 80% of cardiovascular disease, and 60% of all cancers could be prevented through changes in life style and weight loss? According to the Centers for Disease Control, 36% of all adults 20 or over are obese and another 33% are in the overweight category. And 35% of all adults have prediabetes, also called insulin resistance or metabolic syndrome. There is good news, however. Studies have shown that even a small amount of weight loss can lead to significant health benefits and reduce the need for many long term medications. W8md is a physician supervised medical weight loss and wellness program aimed at addressing the complex metabolic, nutritional, hormonal, stress, and sleep related factors under the careful supervision of a weight loss physician for fast and effective weight loss. Unlike the many cash only weight loss clinics, most w8md medical weight loss centers accept health insurance for the weight loss physician visits so you can lose the weight safely and your insurance might pay for the visits. 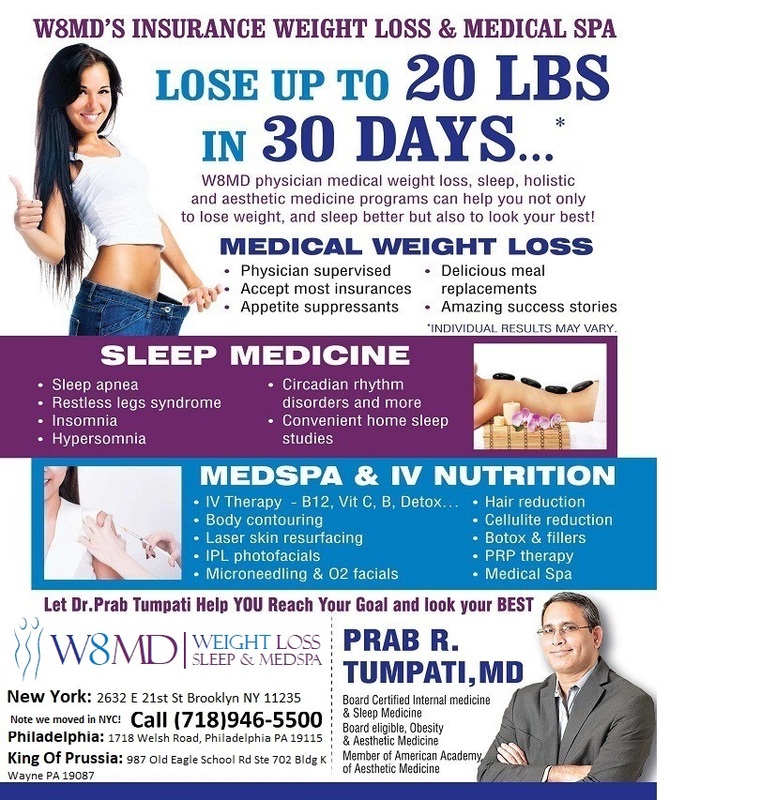 Our medical director, Prab R. Tumpati is a practicing sleep and obesity medicine physician and founder of w8md medical weight loss centers of Ameria. Having passed a written board examination in the field of obesity medicine in addition to being board certified in sleep medicine and internal medicine, Dr Tumpati has passion to educate and change the behavior and beliefs of people when it comes to losing weight.With no setup fees, no mandatory products, losing weight has never been easier. Did you know that the 2010 affordable care act mandates insurance coverage for screening and treatment for all adults for obesity? If you are a physician with an interest in helping your obese or overweight patients, and would like to add w8md program at your office, you are welcome to contact us. Call 1-800-w8md-007 or visit http://www.w8md.com for more information or to find a center near you. Posted on May 21, 2013, in Brooklyn Weight Loss, cheap weight loss nyc, Diet, Diet For Weight Loss, Diet pills, Medical Weight Loss Services, New York City Weight Loss Center, NYC lose weight, nyc weight loss, Very Low Calorie Diet, weight control New York City, Weight loss, Weight Loss Center Locations, Weight loss centers, weight loss doctor new york, weight loss doctors in New York, Weight Loss Medications, Weight Loss News, Weight Loss Success Stories, Weight Loss Videos and tagged Brooklyn Weight Loss, diet doctor, Insurances Accepted For Weight Loss, King Of Prussia Weight Loss, lose weight nyc, NYC lose weight, Obesity, Philadelphia weight loss, Philadelphia Weight Loss Center, vlcd diet, W8MD, Weight loss NYC. Bookmark the permalink. Leave a comment.